While madeleines appear, and, I think, are often mistaken, as cookies that are baked in a molded pan, they are actually small, delicate cakes, originating from France. 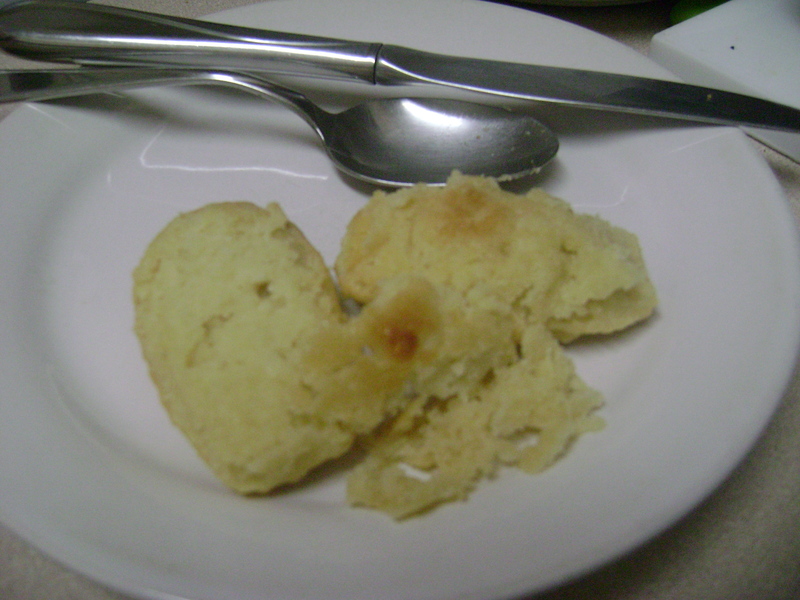 Their flavour is similar, but generally lighter, to sponge cake. 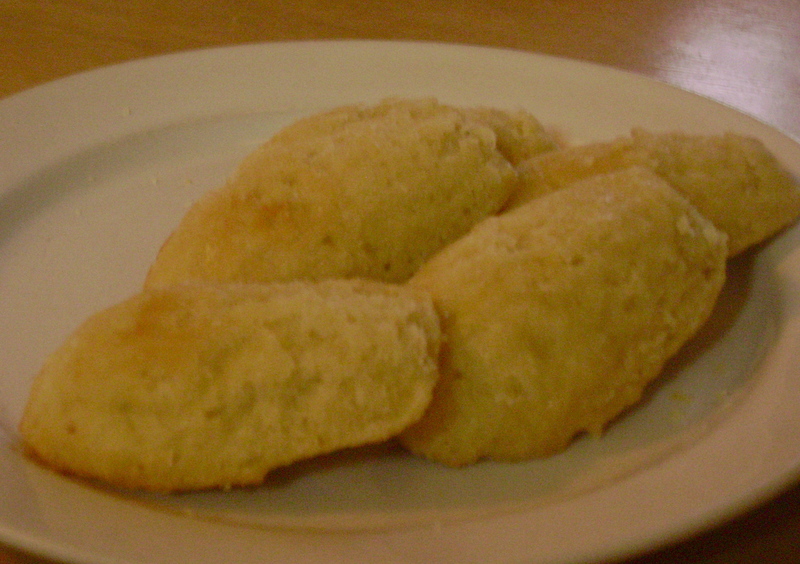 Aside from the traditional madeleine pan, which gives the cakes their unique shape – flat on one side, and rounded shell-like shape on the other – no other special equipment is required. (Madeleine pans can be found in most kitchenware stores; sizes of the actual molds vary from short, almost square-like shell shapes to elongated ones such as mine.) Because of their size, they’re perfect for having with tea, or for those moments when a cake craving arises but we may not necessarily want a whole slice or suchlike. They’re also very portable. I’ve also made cinnamon madeleines, which can be made by adding 1/4 teaspoon ground nutmeg, 1/2 teaspoon ground cinnamon, and 1/2 teaspoon almond extract; baking for the same amount of time as the lemon variety. When plying out the madeleines, I recommend plying them out from the rounded side. Preheat oven to 350ºF. Liberally grease the madeleine molds using vegetable or coconut oil (the greasier, the easier to ply out later – an important and crucial factor to observe, to ensure easy removal of the cakes when done.) Mix all the ingredients together, wet ingredients first and adding almond flour last, to make batter. Fill the molds. Bake for 20 minutes, until fully baked. 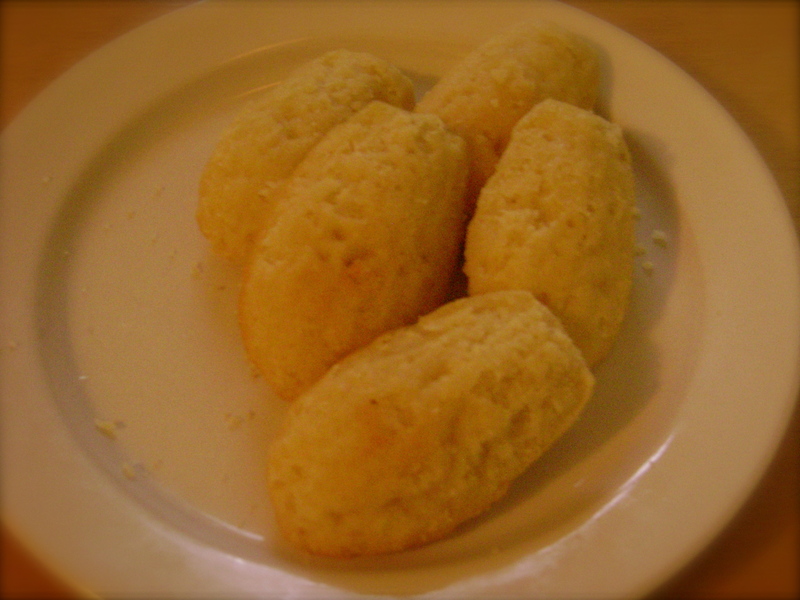 The madeleines will be soft; cool before removing from pans otherwise they may appear crumbly (see image below). Gently ply them out of the mold with a butter knife or a large spoon. Enjoy! Do you really want your madeleines to look like that? I have seen them in different movies and read about them in novels and I always wanted to try and make them. I don’t know why I assumed there was a big secret and that they would be hard to do!!! I have written down this recipe and was wondering if I don’t have almond flour will it make a big difference in the taste? On a side note, I loved the end photo with your caption! I actually spit my tea out as I came to the end of the post. Good job chef! If you didn’t have almond flour, it most likely would have a difference in flavour. Substituting hazelnut or walnut flour (finely ground, but if grinding the nuts yourself, keep an eye on it or else you’ll end up with nut butter) would also probably be good. In regards to regular (wheat) flour, if that’s what you have in mind, I’ve only made madeleines with almond flour, so I wouldn’t know the result of the final product but for flavour, I’d recommend adding maybe a teaspoon of almond extract as well as the lemon extract. Also if attempting to make them with regular flour, I’d start with 1/2 cup of flour and check the consistency of the batter, and then add more if necessary; regular flour, unlike almond flour, is glutinous and I don’t know if 1 cup would make the batter too thick…papier mache dough comes to mind. You could make them into muffins or cupcakes if you don’t have a madeleine pan, however, for the madeleines to have their characteristic shape, they must be made with a madeleine pan. I’ve seen madeleine pans becoming more readily available, they come in different sizes as well – from the size of these ones that I made, to little bite-sized ones. I’m not French, or have an interest especially in French food or culture. I didn’t have any idea that a lot of my recipes are French inspired either! You’ve given me something to think about.